Doritos are already known for being one of the most snackable snack items on the market. Whether you're into Nacho Cheese, classic Cool Ranch, or some of the spicier varieties, it near impossible—to borrow a phrase from one of Doritos' Frito-Lay sister brands—to eat just one. But Doritos' latest release may be the exception to that rule. The chipmaker has produced a limited number of giant-sized Doritos chips to coincide with this summer's premiere of Jurassic World: Fallen Kingdom. The oversized Nacho Cheese-flavored chip measures in at about ten inches tall (the long sides are 11-inches while the shorter side is about 10.25 inches, for all the isosceles triangle fans out there) while retaining the thickness of a traditional Doritos chip. And yes, it's completely edible. As a nod to the sci-fi film, the brand claims the chip was created by Jurassic World scientist Dr. Wu (portrayed by BD Wong) by mingling dinosaur and Doritos DNA. Apparently, chips have DNA in the Jurassic World universe. But a chip this big (and fragile) can't just be shipped out in any old bag. So when the chip arrives, it's hiding inside a replica dinosaur egg nestled within a giant metal Jurassic Doritos crate, with a certificate of authenticity to boot. Only 100 giant Doritos eggs have been created, but that doesn't mean it's impossible to get your hands on one. Just head to Twitter and tweet @Doritos with the hashtags #JurassicDoritos and #entry to be entered to win one. 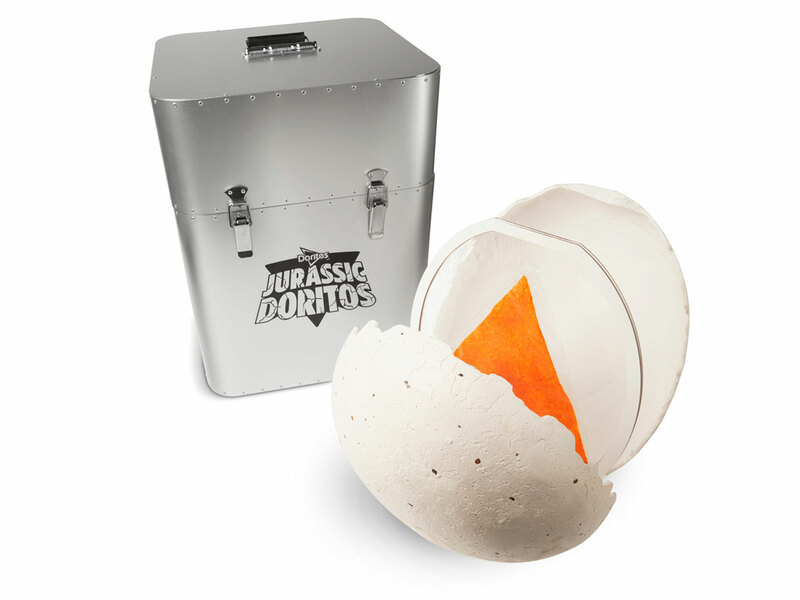 Another way to "adopt" an egg is by heading to JurassicDoritos.com where fans of corn chips and dinosaurs alike can bid on one in an auction. All of the proceeds will benefit disaster relief efforts by American Red Cross chapter in Hawaii, the location of many scenes in the Jurassic World and Jurassic Park movies, so you'd be crunching on your giant chip for a good cause. Jurassic World: Fallen Kingdom stomps into theaters nationwide on June 22.